Since we’re still over a month out until the new adaptation of It and the new season of American Horror Story (which apparently will be featuring clowns in its Cult-themed season this year) hit screens, I thought I’d take the time to watch and review a movie I’ve been wanting to see for a while: Eli Roth’s Clown. This movie actually has something of an interesting history: back in 2010, director Jon Watts and writer Christopher D. Ford uploaded a trailer to YouTube saying that Eli Roth was producing the film, even though he wasn’t involved with the film (I assume this was meant as a joke). Roth was impressed by the concept of the film and their ballsiness, so he offered to help them produce an actual film. However, when this film came out, it did poorly at the box office. Since then, I’ve heard both good things and bad things, making me curious as to its true worth. And when it popped up on my Netflix feed, I knew I had to watch it and see for myself what this film was made of. Clown follows the McCoy family, real estate agent Kent, wife Meg and son Jack. When the party clown they ordered for Jack’s birthday is double-booked and can’t make it, Kent finds an old clown costume in one of his vacant houses and dresses up as a clown himself. However, he finds himself unable to take off the costume afterwards. In fact, it’s starting to become attached to him, literally. As Kent’s body and mind starts to go through unimaginable changes, Meg must find a way to save her husband from becoming a legendary demon with a hunger for children. This film was awesome in so many ways. First off, the costume and Kent’s evolution into the demon. The make-up and costume here is phenomenal, slowly showing Kent turning into this terrifying monster that puts Twisty and Bill Skarsgaard’s version of Pennywise to shame in how scary his look is. The transformation is gradual, but with every change, you see not just how creepy the clown demon is, but also the battle for Kent’s mind playing in his head. From an extra line, a darker color, a colored contact lens, everything in this costume is used to maximum effect. One interesting thing I noticed was the characters, and how they were written. They’re not that deep or well rounded-out, but the story and the direction allows the characters to feel real. Rather than using dialogue and exposition to explain character traits or relationships between characters, the actors show the audience those aspects. Just from Meg’s interactions with her father and the things he does, you get the sort of feelings he has for his son-in-law. From seeing Herbert Karlsson’s actions during the film, you get an interesting twist on the expert-on-a-monster trope in horror films that doesn’t need to be told to the audience. It’s just there for us to absorb! It’s a brilliant decision to approach characterization like this on the part of the filmmakers, and I kind of wish we’d see that in more horror films. Not even the scariest image. The only problems I really had with this film is that it may have dragged at points, and that there’s this one short scene involving Meg and a patient from her dental clinic that I just found slightly contrived. Actually, very contrived, even if it did show how Kent’s transformation is kind of transforming his wife Meg into someone else. Too many good films are under-advertised. Well, with any luck this review might get a few more people interested. On a scale of 1 to 5, I give Clown a 4.8 out of 5. It’s creepy, it’s a fun concept, and it’ll leave an impression on you. Sadly, it didn’t get the advertising it deserved, but I can see this becoming a cult hit and a Halloween favorite ten or twenty years down the line. 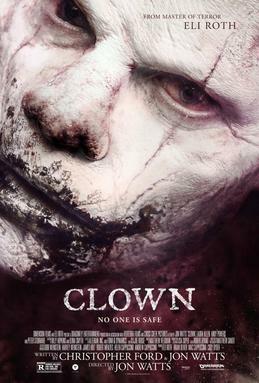 Definitely sit down and watch the film, and prepare for some clown-filled nightmares.